The trick to making a nutritious breakfast a daily habit is never being more than 60 seconds away from something healthy. Because in the morning rush, it’s too easy to grab something unhealthy. Lately, my go-to quick and healthy choice has been oat pudding, mostly because my kids love it. But I also like the staying power the complex carbs and fiber have to keep us feeling full. Oats or oatmeal (plain, not the flavored quickie pouches), are on just about every list of heart-healthy foods, as it has a nice dose of both soluble and insoluble fibers. Oats also bring a few grams of protein to the party, while having less than a gram of sugar. Even non-instant rolled oats are really only a few minutes away from being cooked into the iconic breakfast porridge I grew up eating (at the insistence of my grandma). But sometimes 5 minutes feels about 4 minutes too long, at least at our house. And more to the point, my family doesn’t all love oatmeal as much as I learned to. Oat pudding solves these problems. And more. Oat pudding is made the night before (and only takes a few minutes), and can be customized to your tastes. It’s easy to add almond butter, cocoa powder, maple syrup, berries, cinnamon, applesauce, fresh or frozen fruit, shaved coconut, or whatever else you enjoy. The key is to mix about equal parts oats and liquid, add the flavorings, then let the pudding rest in the refrigerator for at least an hour and up to 48 hours. Pull the pudding out of the fridge, top with any extras (like fruit, nuts, honey or maple syrup) and enjoy. Or pop in the microwave for a minute for a warm pudding. Easy. And so much better than Grandma’s big pot of sticky porridge. In a medium bowl, whisk together the yogurt, milk and jam until smooth. Add the chia seeds, vanilla, chocolate chips and oats and mix until well blended. Cover and chill for at least 1 hour or up to 2 days. 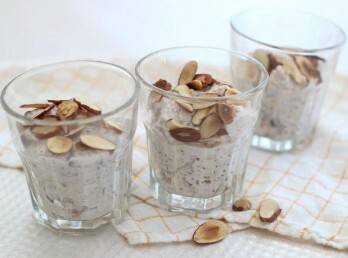 To serve, top with toasted almonds. Nutrition information per serving: 250 calories; 70 calories from fat (28 percent of total calories); 8 g fat (2.5 g saturated; 0 g trans fats); 10 mg cholesterol; 34 g carbohydrate; 3 g fiber; 18 g sugar; 11 g protein; 50 mg sodium.